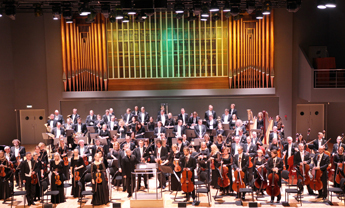 The Estonian National Symphony Orchestra (ENSO; known in Estonian as Eesti Riiklik Sümfooniaorkester or ERSO) is the longest continually operating professional orchestra of its kind in the country. The orchestra’s history dates back to 1926 and, like that of many other world orchestras, is connected to the birth of national broadcasting. Since 2010, it has been led by principal conductor and artistic director Neeme Järvi, while Paavo Järvi has been its artistic advisor since 2002, and Olari Elts its principal guest conductor since 2007. The orchestra’s previous principal conductors include Olav Roots (1939–44), Paul Karp (1944–50), Roman Matsov (1950–63), Neeme Järvi (1963–79), Peeter Lilje (1980–90), Leo Krämer (1991–93), Arvo Volmer (1993–2001) and Nikolai Alexeev (2001–10). The orchestra performs with renowned conductors and soloists from around the world, including Estonian musicians of the highest calibre. Its recordings demonstrate a quality recognized by many prestigious music magazines, having won several prizes, including a Grammy Award. In addition to broadcast performances on Estonian Public Broadcasting, ENSO has also been aired on the Mezzo television channel. The orchestra’s home venue is the Estonia Concert Hall in Tallinn, but it has also undertaken more than fifty concert tours, most notably tours of Italy in 2003, the USA in 2009, 2013, and 2018, and China in 2016. In addition, ENSO has regularly given concerts in European and Scandinavian countries, appearing at many prestigious festivals including Köln, New York, Verona, Genoa, Munich, and Stockholm. With a repertoire ranging from the Baroque period to the present, the Estonian National Symphony Orchestra has also given premiere performances of symphonic works by several Estonian composers, including Arvo Pärt, Erkki-Sven Tüür, Eduard Tubin, Eino Tamberg, Jaan Rääts, Lepo Sumera, Tõnu Kõrvits and Helena Tulve.